Are you dreaming of growing out your short bob into beautiful, long locks that will turn heads? No need to dream any longer. Get thick, long, luscious hair instantly with hair extensions that look and feel natural from Chroma Hair Studio. For high-quality hair extensions Brisbane wide, Chroma Hair Studio expert hairdressers use Showpony extensions to give you luscious locks instantly. For any Showpony extension fans out there, you will be happy to know that we offer our Showpony range for the lowest prices you will find anywhere! No need to look for Showpony extensions anywhere else. All of our Chroma Hair Studio salons across Brisbane provide this service at a price you will love! If you are looking to add length, volume and body to your hair, we are experts at Showpony hair extensions Brisbane wide. Our hair salon experts have the skills to transform your thin or short hair into a vivacious mane of gorgeous, thick locks. We only use the very best products at Chroma Hair Studio, which is why we choose to use the reputable and highly popular Showpony extensions. Showpony hair extensions are used by many celebrities Australia wide. Showpony extensions are natural looking, consistently colour accurate, long-lasting and blend beautifully with your natural hair. At Chroma Hair Studio, we carry two different types of hair extensions from Showpony. These include the traditional tape extensions and the new skin weft extensions. Both have their own benefits, so speak with one of our expert hairdressers to decide which option is best suited for you. Want the best Hair Extensions for best possible price? Pay for your extensions upfront, which includes your consultation and also your application appointment, then call us to book your amazing transformation. Hair extensions can be used in a variety of ways to give you the perfect look. You may be surprised by the versatility hair extensions can provide. Take a look at some ideas below for some inspiration on how hair extensions can improve the look of your hair. If you already have the length but your hair is thinner than you would like, increase the volume of your hair by adding extensions. A half head of hair extensions is perfect to bring thickness and life back to your hair. Thinking of adding colour to your hair but you don’t want anything permanent? Rather than lightening or colouring your own hair, choose hair extensions instead. Well placed coloured hair extensions mimic foils without permanently changing the colour of your hair and the colour will blend beautifully with your natural hair. Hair extensions are ideal for adding much-needed length to your hair. Don’t waiting for your hair to grow when you can get long hair instantly! Many beautiful and stylish up styles require thick hair to pull off the perfect look. Hair extensions can be incorporated to add the wow factor you need by giving you enough volume for the up-do you desire. The traditional tape hair extensions method is a popular choice. The tape weft method of applying hair extensions involves sandwiching a small fine slice of your hair between two 4 inch wefts of extension. This method is ideal for many hair types and is especially suited to fine hair because the tape is almost see-through and lays extremely flat against the scalp. We use the traditional tape form of extensions above beads as they are less visible, much more comfortable and are less likely to fall out. Our customers keep coming back to achieve amazing hair results with traditional tape extensions. Traditional tape hair extensions typically last between 6 to 12 weeks, making them perfect for anyone looking for a hair extension method that lasts. Hair extensions are something you have to live with every day, so they have to be comfortable. Tape hair extensions feel comfortable in your hair because they lay flat against your head. Thanks to the transparent tape applying flat to the head, it makes it very difficult to see where the hair extensions are applied, providing a natural look. Tape hair extensions are usually reusable. However, this is dependent on the hair quality. It is possible to re-tape them up to three times, but we recommend that you visit our salon for a maintenance appointment to get a beautiful looking result. Generally traditional tape hair exertions are easier to style than many other methods, even when straightening or curling. This is because these extensions are applied to the head so naturally. The most effective form of hair extensions available are Skin weft extensions: the newest way to apply extensions to your hair. 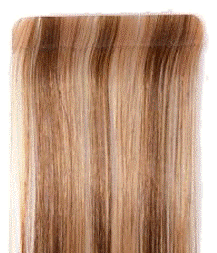 This is similar to traditional tape extensions, however, the hair goes to the top of the tape and comes out evenly down the width of the tape. The skin weft method creates a final result that is superior to current hair extension methods. Skin weft is the most invisible hair extension available, even rivaling tape extensions for its discreteness. Because it is flat to the scalp and can be applied close to hairlines, these extensions are virtually undetectable. These hair extensions are well suited to fine hair because the extensions are much less visible. These extensions can last from 12 to 24 months as long as you are caring for your hair appropriately. This is one of the longest lasting hair extension options available. Make sure to arrange maintenance appointments with us to keep your hair extensions looking fabulous. Much like the traditional tape method, as the extensions are laid flat to the scalp, it is very comfortable to have these extensions in your hair. No need to worry about your hair extensions falling out or becoming damaged due to styling. These hair extensions are durable and a permanent addition to your hair, making styling easy and effortless. Curling, straightening or creating an fancy up-do, skin weft extensions will blend with your hair seamlessly and stay in place. Not only are skin weft extensions comfortable and long lasting, but they are also extremely quick and easy to apply to your hair. With one of our experienced stylists applying your hair extensions a full head of hair extensions can take less than an hour! You will be in and out of the salon in no time with a new hair transformation. Want to add a little bit of colour to increase the vibrancy of your hair, or make a statement with a bold new colour? Whatever look you are dreaming of, we have Showpony hair extensions available in a wide range of colours to get you there. 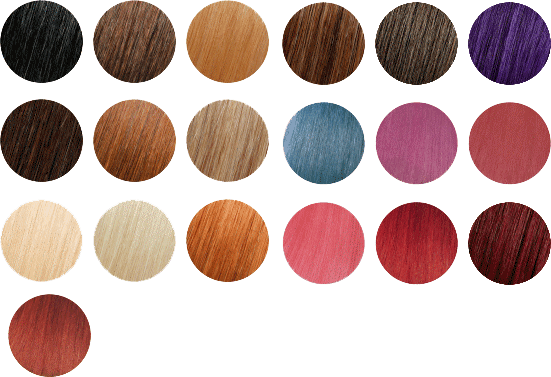 There’s no need to worry about a new colour looking unnatural or out of place in your hair because Showpony has a large range of colours which are two toned to give your hair a more natural look. Talk with one of our stylists to work out the best colour to achieve the look you are after. Having great looking hair does not end at just having hair extensions applied by one of our highly skilled stylists. You have to take the time to maintain those locks also to keep them looking fabulous. A great moisture shampoo and conditioner is a must have to keep your extensions feeling nice and soft. You should have maintenance appointments every 8 to 10 weeks with one of our salons to avoid any matting that may occur as your hair grows out. When you visit one of our Chroma Hair Studio Salons and speak with our expert stylists, they will provide you with all the information you need to maintain your beautiful new hair correctly. If you are looking for a salon that provides high-quality Showpony hair extensions in Brisbane, Give us a call and arrange an appointment for a stunning new look with Showpony hair extensions this season!